When did Kale become so popular? Kale used to be the forgotten leafy green, used only to garnish plates and buffet salad bars. Over the past few years, its popularity has skyrocketed. Your guess is as good as mine as to why. Now, you find it in chips, smoothies, juices, salads, soups, cupcakes and practically anything you can think of! Kale is the king of the superfood kingdom and the trendy symbol of healthy eating. It even has its own food holiday. On October 1st we celebrate National Kale Day! While in Portland Oregon this summer, I noticed Kale was on every menu I encountered – from deli shops to food trucks to fine dining. Romaine and Spring Greens were out, kale was in. Not surprising for such a foodie town. Orlando seems to have caught on to the kale trend as well. My favorite Kale recipe is my sister’s Kale & Currant salad, which requires massaging the kale. It’s exactly what it sounds like – tedious and time-consuming. Since GO Epicurista is all about Easy Entertaining, I’m happy to share this Citrus Kale Salad recipe from Cocina 214 Restaurant in Winter Park, which is considerably easier to make. ^Add Citrus Cilantro dressing, mix and serve. ^ Mix mayo, vinegar and water. Add Jalapenos, garlic and cilantro. ^ To make this salad into a full meal, add grilled shrimp or chicken. ^ When tossing the salad with the dressing, use your hands (wash them first) and really get in there and work the dressing into the kale leaves, scrunching the leaves as you toss them. Yes, this is like massaging the kale but only for about a minute, and there’s no need to be gentle. These greens are tough. Massaging the kale does make it easier to eat and less bitter. ^ If you really like citrus, like I do, add orange segments or a splash of OJ to the dressing. ^ This salad, with its citrus tones and bitter tendency of kale, would pair well with a crisp Sauvignon Blanc and its grassy, citrus aromas, or an unoaked chardonnay. If you want something with a bit more kick, then go for a Citrus Jalapeno Infused Margarita. This is a fun salad, full of flavor and all the superpowers of kale. All you need is to invite some friends over, make the salad, chill the wine and enjoy. Simple, no fuss, fun with great food and wine. This is GO Epicurista Easy Entertaining and the most important ingredient is your friends. If you really don’t feel like cooking, then simply GO to Cocina 214! What’s your favorite way to eat Kale? Please share in the comments below. 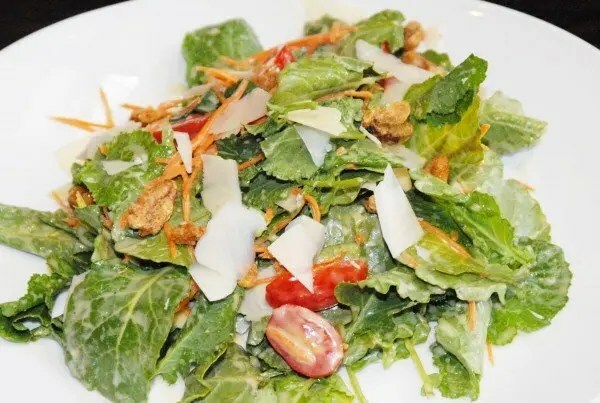 Thank you Cocina 214 for providing this delicious Cocina Citrus Kale Salad recipe. Cocina 214 award-winning Tex Mex menu combines bold flavors with fresh local ingredients, in an elegant contemporary setting. Located at 151 Welbourne Avenue East, Winter Park, FL. 407-790-7997. Check out their daily happy hour from 4:30pm-6:30pm or Sunday Brunch from 11am-3pm for a fun outing with friends.